We are excited to announce the McGinnis Venture Competition, a platform exclusively for Carnegie Mellon University’s community of student entrepreneurs. The McGinnis Venture Competition brings together Carnegie Mellon's best and brightest student entrepreneurs to compete for $60K in investments. All participants receive crucial interaction with alumni entrepreneurs and venture capitalists, an opportunity to raise capital and valuable feedback about ventures. This multi-round competition kicks off in early January, starting with two virtual rounds and culminating in a final live round celebration at Carnegie Mellon University. The 2019 McGinnis Venture Competition registration opens on Thursday, November 1. The Round 1 submission deadline is on Wednesday, Janurary 23, 2019 via Startup Compete. Register by Tuesday, December 4 to be guaranteed to be assigned a coach for the competition; for those who register after December 4, we cannot guarantee that you will be assigned a coach. 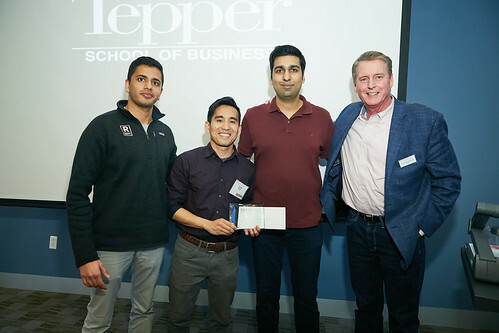 The final live round will be held at Carnegie Mellon University, Tepper School of Business, Tepper Quad on Tuesday, March 26, 2019. Join us to view the live final round teams pitch to a panel of judges. First Place: Delta Band is a wearable strength training platform that brings automatic workout tracking, intuitive goal setting and personalized recommendations right to your wrist in the gym. Team includes Matt Spettel and Gabriel Madonna. Second Place: LittleMoochi is a mobile app that encourages children to form healthy eating habits through an AI-based virtual pet. Team includes Summer (Qinxian) Xia, Yi Xu, Zhuyun Dai, Molly Vierhile and June Byeon. Third Place: Tarseer is designing a headset to detect and monitor glaucoma, the leading cause of irreversible blindness, everywhere around the world. Team includes Jorge Antón Garcia and Michael Tatum. First Place: Ecotone Renewables makes sustainable food and agricultural systems more accessible and prevalent outside the industrial scale, closing the food loop and creating a 21st century food system. Team includes Sasha Cohen Ioannides, Vinh Luong, Catherine Schrading, Alexis Hoane, Dylan Lew, Kareem Rabbat and Adam Balick. Second Place: Glow Up is the Marketplace for all Hairytypes: the first platform and community focused exclusively on black hair care with content made by black women for black women. Team includes Mayowa Hannah Osinowo, Obed Appiah-Agyeman and Mecca Parker. 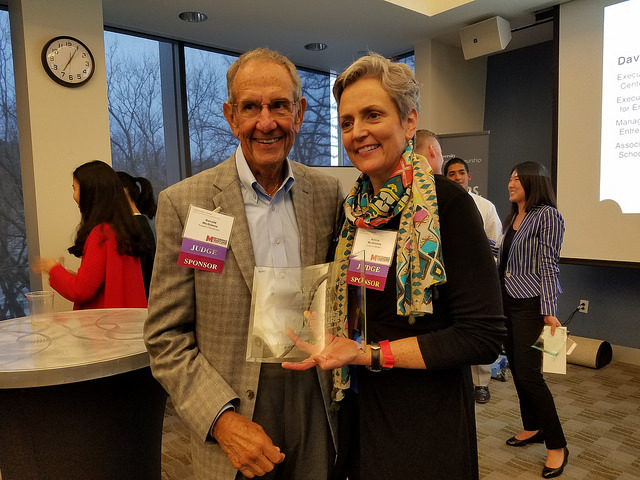 The McGinnis Venture Competition is made possible by a generous endowment from Gerald E. McGinnis, founder of Respironics. 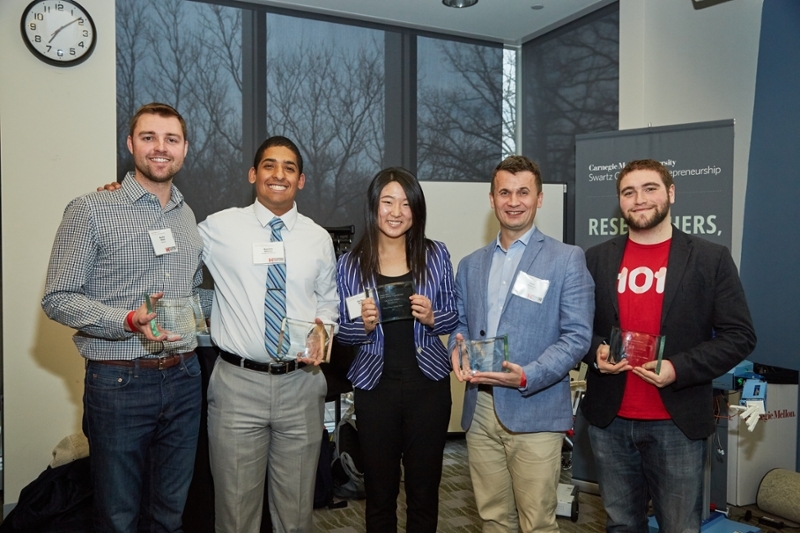 Undergraduate track winners are also awarded a place in the CMU Venture Challenge. *Investments are awarded in the form of a convertible note. The remaining $3,500 will sponsor the CMU Venture Challenge. The competition includes coaches for each team that declares participation in the McGinnis Venture Competition via Startup Compete by Tuesday, December 4, 2018. The Swartz Center staff will match the appropriate team with an appropriate coach. If a team is not registered by Tuesday, Dec. 4, 2018, the Swartz Center cannot guarantee that a coach will be assigned for the competition. Meet and interact with peers who are also passionate about entrepreneurship, and gain access to Carnegie Mellon’s amazing entrepreneurial alumni network. Teams from all rounds enjoy access to exclusive networking events. CONNECTS events are held throughout the year to help teams prepare. Registration opens. View competition application requirements: Executive summary [pdf] and video pitch constraints via the Swartz Center website. Declaration of Intent to Compete due. If you register via Startup Compete by this date, you will be guaranteed to be assigned a coach for the rest of the competition. For those who register after December 4, we cannot guarantee that you will be assigned a coach for the competition. Round 1 submission deadline at 11:59 pm EST. Round 1 executive summary [pdf] and video pitch due via Startup Compete. Round 1 judges can view team’s applications at 5 pm EST. Round 1 judging ends at 11:59 pm EST. Teams notified. Round 2 begins at 5 pm EST. Round 2 submission deadline at 11:59 pm EST. Round 2 updated executive summary [pdf] and video pitch due. Round 2 judges can view team’s applications at 5 pm EST. Round 2 judging ends at 11:59 pm EST. Teams notified. Round 3 Begins at 5 pm EST. Round 3 Mini-Business Plan [pdf] due at 11:59 pm EST. Round 3 judges can view team’s applications at 5 pm EST. Live Final Round will be held at Carnegie Mellon University. The McGinnis Venture Competition is open to all current Carnegie Mellon University undergraduate and graduate students who have created, managed and owned ventures. A CMU student should be CEO, CTO or COO. Members of the student team should also own a significant majority of the equity allocated to all parties. Non-CMU students may be members of the venture’s management team and may participate; however, current CMU students should deliver the majority of the content in all of the rounds. If you have all undergraduate students on your team you will be considered in the undergraduate track. If you have all graduate students on your team you will be considered in the graduate track. If your team is made up of both graduate and undergraduate students you will be considered in the graduate track. You will not be eligible to compete in the undergraduate track. The Executive Summary must be 3-5 pages in length. Please use the Executive Summary/Mini-Business Plan [pdf] for guidance. A 5-minute Video Pitch targeted to investors is also required. You should pretend you are pitching to real investors and include all pertinent information. Record your Video Pitch and insert a Vimeo link on Startup Compete. The Executive Summary and Video Pitch must be submitted on Startup Compete. Round 1 closes on Wednesday, January 23, 2019 at 11:59 pm EST on Startup Compete. *If you need to borrow video equipment to make your video, visit Clusters Multimedia Lending. Submit via Startup Compete an updated Executive Summary and Video Pitch (Vimeo). Use the feedback that you received from Round 1 to improve. Watch an example pitch from Neon Labs. Round 2 closes on Wednesday, February 20, 2019 at 11:59 pm EST on Startup Compete. We suggest that you use the Executive Summary/Mini-Business Plan[pdf] as guidance when creating your business plan, which should be 5-10 pages. You can add additional information to your business plan. Sample successful mini-business plans from some of our 2013 winners: Lumator [pdf] and Playpower Labs [pdf]. Business plans are due Tuesday, March 19, 2019 at 11:59 pm EST on Startup Compete. The live presentations are varied based on the graduate and undergraduat tracks. Graduate tracks are 8 minutes long followed by 7-minute Q&A from the judges, and undergraduate tracks are 6 minutes long followed by 6-minute Q&A from the judges. Time limits are strictly enforced. The live round will be held at Carnegie Mellon University on Tuesday, March 26, 2019. The authors of the executive summaries and mini business plans will retain all rights to the executive summaries and mini business plans regarding its use at all times prior to and following the competition except as stated below. Due to the nature of the competition, we will not ask judges, reviewers, staff or the audience to agree to or sign non-disclosure statements for any participant. All public sessions of the competition, including, but not limited to, oral presentations and question/answer sessions, are open to the public at large. Any and all of these public sessions may be broadcast to interested persons through media that may include radio, television and the internet. Any data or information discussed or divulged in public sessions by entrants should be considered information that will likely enter the public realm, and entrants should not assume any right of confidentiality in any data or information discussed, divulged or presented in these sessions. Carnegie Mellon University may make photocopies, photographs, videotapes and/or audiotapes of the presentations including the business plan and other documents, charts or material prepared for use in presentation at the McGinnis Venture Competition. Students retain all proprietary rights. The university may use the materials in any book or other printed materials and any videotape or other medium that it may produce, provided that any profits earned from the sale of such items is used by the university solely to defray the costs of future competitions. The university has non-exclusive world rights in all languages, and in all media, to use or to publish the materials in any book, other printed materials, videotapes or other medium, and to use the materials in future editions thereof and derivative products.